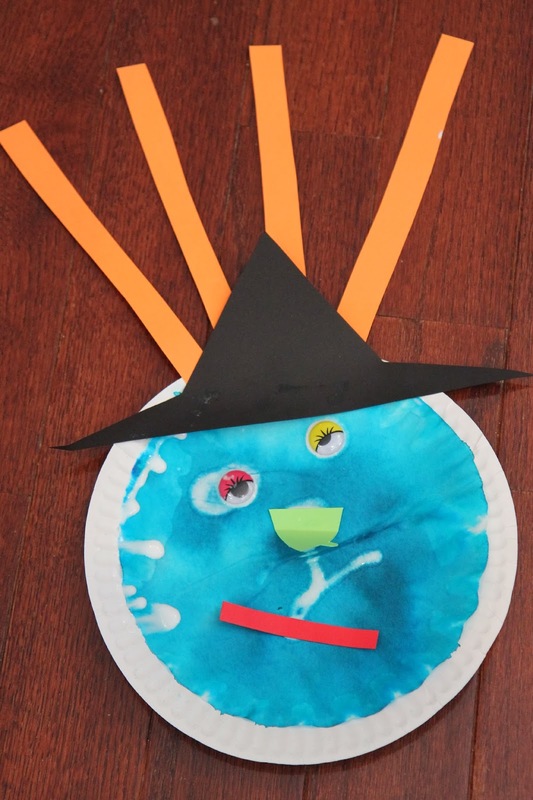 I am excited that Halloween is tomorrow and had to fit in one last themed activity at preschool this week using one of our favorite books... Room on the Broom by Julia Donaldson. If you want to learn more about our little preschool, go to this preschool intro post that I shared. For our little 3-year-old preschool class I wanted to do one craft and a few little activities that didn't require much set up or prep! Check out two of the activities that we did today at school. We had so much fun making spray bottle paper plate monsters a few weeks ago, so I decided to use the same technique to help make our witch masks! Materials needed: coffee filters, spray bottle filled with water, washable markers, paper plates, googly eyes, Elmers glue, and paper scraps (I pre-cut hats, mouths, strips for hair, and noses). 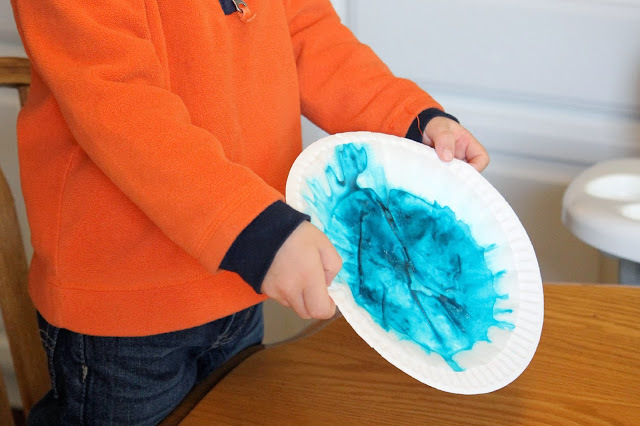 The kids started off by coloring their coffee filters with washable markers (on top of the paper plates). Then they sprayed the coffee filters covered with marker and watched as the marker designs started spreading and covering the entire filter. They moved their plates around to make the designs move more. Then we let all of the designs dry while we went and read Room on the Broom by Julia Donaldson. After the paper plate designs dried, the kid used glue (with some help) to stick googly eyes, hair, noses, etc. on to their witches. Several of the kids were really excited about having lots of eyeballs on their witches! They all turned out so cute and it was fun to see how each witch was different. I even made one with them because it was such a fun and easy craft (mine is the boring one... bet you can guess which one). We didn't glue the coffee filters onto the paper plates because the kids used so much glue when they attached things that the filters stayed put. If your kids use less glue, you may want to adhere the filters to the paper plates with a little more glue. I like having the paper plate backing because it makes the mask a little less flimsy since coffee filters are super thin. 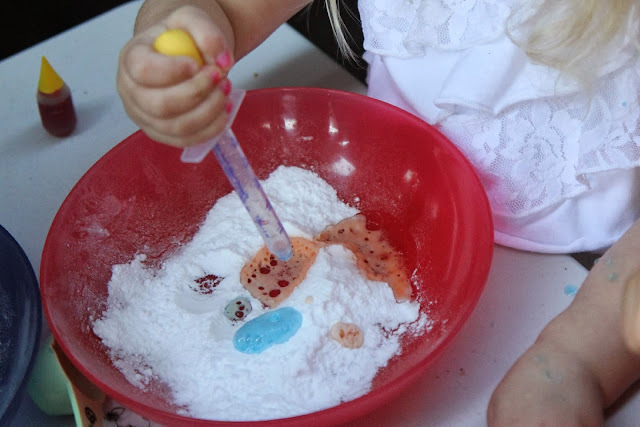 At our witch themed preschool today we also did some fizzy potions and milky explosions. You can click on the links below to read more specific details on how to do these activities since we have shared about them before. Need any other last minute ideas for Halloween? 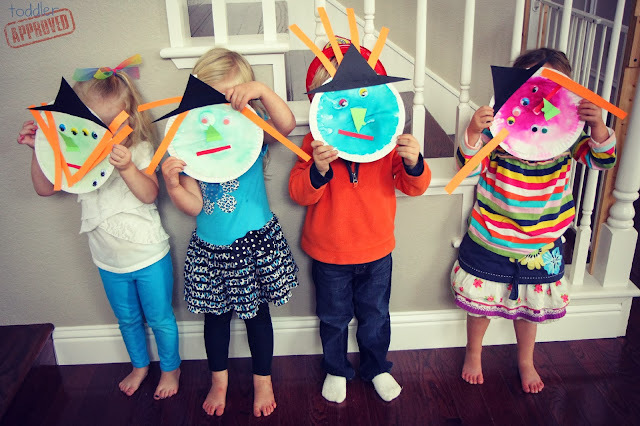 Check out our Halloween learning activities post and our 10 favorite Halloween crafts and activities.